When Rechungpa, a student of the eminent Tibetan yogi Milarepa, was returning home from his studies in India, his master went out to meet him. Along the way it started to rain, and Rechungpa lost sight of his guru in the wind and fog. He could hear the master singing through the storm but couldn’t see him. When Rechungpa finally caught sight of Milarepa, he was sheltering from the rain inside a yak horn, singing and laughing. As mystifying as that feat was, the part that really blew Rechungpa’s mind was that Milarepa fit within the yak horn without making his body smaller or the yak horn bigger. To us, as well, the baffling thing about this story is not the possibility of magic—which is a given in so many stories—but the logical dissonance of it. We can’t picture this in our mind’s eye. We may try again and again to envision it, but it breaks the boundaries of our conceptual framework. Gendun Chopel, an early twentieth-century monk and scholar, maintained that Milarepa wasn’t the one toying with reality. Rather, he said, we ordinary, confused people are the real magicians. The Buddha taught that the universe and its inhabitants are like appearances in a dream. If that’s true, then the habitual reification of our moment-to-moment experience is quite an accomplishment. Everything we experience is unreal, no more than illusions, as fleeting and insubstantial as the moon’s reflection on the surface of the water. Yet we make it real by continually transforming the spurious phenomena of our world into a concrete reality. By defying the laws of our perceived “real world,” Milarepa was revealing the true nature of reality. Visualization practices deconstruct our rigid concepts of what is and isn’t possible. The sutras and tantras are full of these kinds of mysteries, such as universes contained in a single atom, inconceivable by conventional standards. Contemplating such mysteries is one of many methods the Buddha taught to help us undo the magical trick our minds play on us. In Vajrayana Buddhism, visualization practices are one of the primary tools employed to demystify these so-called mysteries by deconstructing our rigid concepts of what is and isn’t possible. Vajrayana practitioners strive to cut through fixed ideas about what is real and unreal by visualizing striking scenes and beings, including colorful deities with many heads or arms, some peaceful and others wrathful. By imagining one’s ordinary dwelling as a celestial palace, it’s possible to transform the mundane world into a divine mandala. But what is the use of conjuring appearances that seem to have no bearing on our ordinary lived experience? As good Buddhists, aren’t we supposed to become more grounded in reality, not live adrift in an imaginary world? How could superimposing deities and palaces have any practical benefit? It’s natural to worry that visualization practice could cause us to view the world naïvely, through rose-colored lenses. We may even fear that by blurring the line between the real and the unreal, we could end up with a serious mental disorder. The Vajrayana tradition itself acknowledges such possibilities. On the one hand, such apprehensions overlook the fact that our day-to-day experience of reality is no more real than what we imagine in our visualization practice. Things appear to us as real and solid because we magicians have already conjured an elaborate illusion. From the moment we open our eyes or perceive with any of our other senses, we’re already deeply entrenched in constructing a distorted reality. Our experience of right now, even though it arises effortlessly and automatically, is no less a visualization than is a colorful deity or a mandala. Paradoxically, though, by diligently visualizing everything as a pure and perfect mandala, we direct our minds toward an experience that is more in line with the way things really are. Through visualization practice, we can come to understand emptiness not just as a negation of real things but as an open space within which anything is possible. On the other hand, just as the tradition warns against reifying our mistaken perceptions of this illusory world, it also warns against reifying the visualized world. Moreover, the emphasis on compassion does not allow the practitioner to forget that illusory world, nor to ignore the suffering experienced by those tethered to it. In this way, the tradition steers between its Scylla (the psychosis of clinging to one’s visualizations) and Charybdis (the mundane neurosis of lived reality). Is this method open to abuse? Undoubtedly. However, among the welcome and refreshing testimonies of people who have suffered within the Vajrayana tradition, there can be heard the persistent question: why am I always viewing the other person as a buddha, and never myself? While I cannot responsibly address the abuse of Vajrayana methods in this article, I should clarify that the visualization practice I am discussing here involves a transformation of oneself, and all others, into fully awakened beings. The radical potential of this perspective for all, from the marginalized communities of classical India (the mahasiddhas in particular) to those of us today, cannot be emphasized enough. The basic premise of the Buddha’s teachings is that everything is emptiness; things appear while being insubstantial. They are like phenomena in a dream. Though we hear this again and again, our persistent perception that we inhabit solid bodies, surrounded by a world filled with concrete objects, belies this truth. We neither see nor feel emptiness, and merely hearing that everything is an illusion does not enable us to actually experience it. Our aging bodies, the wooden table we lean on, and the cobblestones we walk upon all feel just as solid as ever. Through visualization practice, we can come to understand emptiness not just as a negation of real things but as an open space within which anything is possible. Visualization is a way to play with emptiness, allowing us to integrate it into our lived experience rather than holding it as a purely academic theory or assertion. Through repeated visualization, we gradually dematerialize solid reality, unfreezing our perceptions and freeing them from the clutches of our ingrained ideas about what is possible or impossible, real or unreal. We do not import into our visualization practice the physical laws of the ordinary substantial world, where size, space, and time can become impediments. In our visualizations, nothing can hinder anything else—all appearances are truly empty and transparent. And, even though we do work with size and direction when we visualize, we imagine them to be in dimensionless, timeless space. Through visualization, we directly experience the Buddha’s teaching that the world is beyond the restrictions of space and time. As a tantric meditator loosens her grip on concepts of size, location, and time, there is no obstacle to perceiving the entire universe in a single atom. For her, Milarepa can easily fit inside a yak horn, or pirouette in midair if he wants to. Mired in delusion, we fail to see that this seemingly imperfect world is in its very nature perfect and pure. 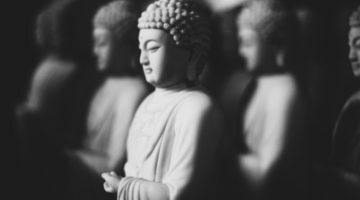 Your mail carrier may be an accomplished siddha, a stray dog a powerful deity, or the noisy, crowded city street a field filled with buddhas and bodhisattvas. In fact, according to Vajrayana teachings, these possibilities are all true, as each small particle is said to contain billions of universes of complete awakening. It is truly inconceivable! In order to perceive this reality, we need a state of mind that is utterly open, in awe and wonder at all these endless possibilities. That disposition serves as the point of entry to serious practice. It may be a lot to swallow, but Vajrayana training depends on our embracing this radical open-mindedness. The proof of this radical perspective lies in its liberating effects. The great Nyingma teacher Longchenpa likened it to two men celebrating in a palace, surrounded by absolute abundance. If at some point one of them dozes off and begins to have a nightmare, the other person, who is still awake and fully aware, may notice his friend is moaning and crying in his sleep and gently wake him. Upon awakening, the two of them will look at each other and laugh. What prevents us from directly experiencing the world’s flawless perfection is that we don’t take emptiness seriously. On some level, we believe emptiness is just a theory, an idea, rather than the nature of our own reality. Instead of living by the understanding of emptiness, we choose to nurture our magical powers of clinging and fixation, continually recreating a world where everything appears to be static, solid, polluted, and so very real. 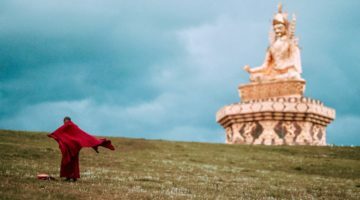 The development stage of Vajrayana helps us make contact with the innate purity we have become distanced from; it is the supreme method for quickly reversing our long-standing magical tricks. As the name of this practice suggests, we must develop and be creative. Our first footsteps here are meant to encompass the entire path, bringing the fruit of enlightenment right into the present moment. This is the reason Vajrayana, the “lightning bolt vehicle,” is said to be so swift. We begin by visualizing ourselves as a single deity. 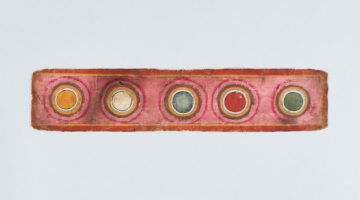 Next, we are not only that main deity but also the retinue within the mandala of the deity. Finally, we experience the entire mandala, along with its protection circle, or palace, as inseparable from ourselves. This practice loosens the rigid boundaries between ourselves and the world around us, and eventually, the mystery of reality as ultimately nondual begins to make experiential sense. We can enjoy the resplendence of awakening right now. Initially, it can be challenging to believe visualization practice really works. 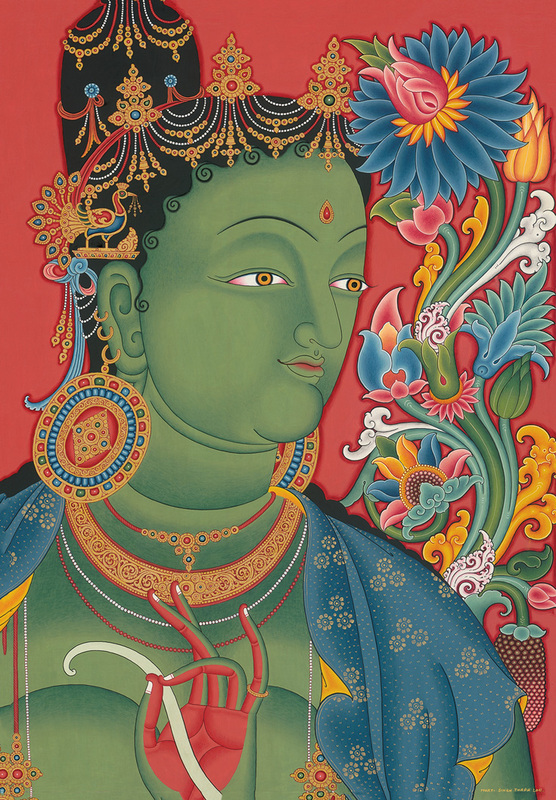 If we are told to transform ourselves into Green Tara, for example, we may diligently go about picturing that, but when we look again, our bodies still look and feel like our old familiar selves. Nothing has changed. Though we may not feel any change for a while, the greater our openness to the possibility of being able to change appearance in an instant—and the greater our confidence in our experience that everything is emptiness—the more quickly our transformation takes place. It is crucial that we approach this practice with a sense of open-ended possibility. The wondrous vehicle of the Vajrayana, which “takes the result as the path,” does away with our poverty mentality, the underlying sense of never having enough and of not being good enough. It also eradicates our neediness and our continuous compulsion to accomplish something in the future. Our insistent urge to become somebody else—somebody who is more amazing, perfect, and powerful at some point in the future—is an impulse that pulls us away from fully experiencing the richness of the present moment. 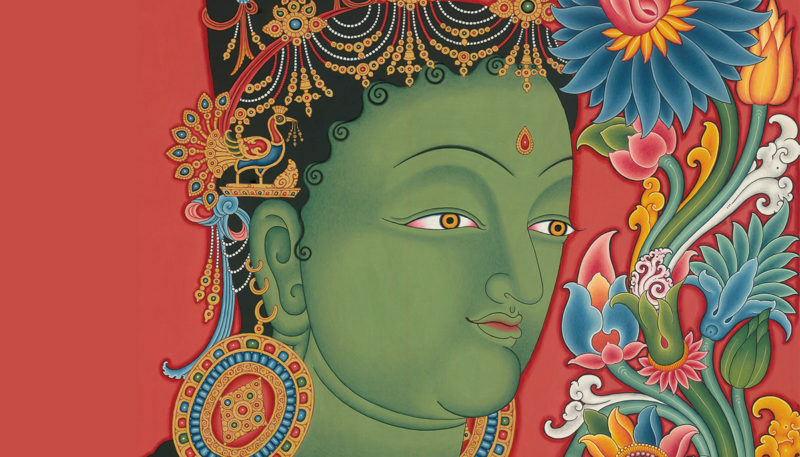 From the Vajrayana perspective, the craving for something beyond what is manifest right now is ultimately created by our mistaken belief in a self—a belief that inhibits our appreciation of the way things truly are and prevents us from being present to our full potential, right here and now. The good news is that in a moment of correctly applied Vajrayana practice, these urges and impulses completely evaporate, freeing us to encounter wonder and magic. When we begin to visualize all this as a transparent realm of perfect awakening, we acknowledge emptiness in the present moment. Actively and playfully, we can then bring the result of the path—enlightenment—into the present. The result is right here, in this moment. We don’t have to wait. We can enjoy the resplendence of awakening right now and share it with others. Whether or not we are able to take advantage of the fast vehicle of Vajrayana practice hinges entirely on our ability to discredit the overwhelming sense of a real phenomenal world. We must let go of our attachments and stop falling for our own magical tricks. We must be completely honest with ourselves. Although we may be magnificent magicians, the world we have conjured is full of suffering. Now is time to finally dissolve it.